With increased interest in high resolution page arrays, a major issue is maintaining print quality in the event of nozzle failures. Nozzles may fail for a variety of reasons — clogging due to debris or the ink viscosity increasing locally. Air bubbles may get trapped inside the actuator chamber, or the nozzle plate can become contaminated. Many of these failures can be overcome by performing some nozzle maintenance, while firing adjacent nozzles can compensate for more permanent failures. While it is possible to regularly perform nozzle maintenance, this can be problematic with single pass page array printing. It is possible to spit drops onto the substrate either in between pages, or even in the images or background areas. but any more extensive maintenance, for instance cleaning the nozzle plate or purging ink from the nozzles, requires a halt to printing while the maintenance station and printhead are brought together. Therefore it is becoming more desirable to know the status of all nozzles all of the time. With this knowledge nozzle maintenance can be carried out when required, rather than at regular intervals. In addition missing nozzle compensation algorithms can be used to maintain high print quality in the event of nozzle failures. Popular techniques for determining missing nozzles are optical systems to either detect drops in flight or dots on the substrate after printing. Neither of these processes are easy to implement. Here Canon explores building detection circuits under the heaters in each actuator chamber to detect partial or full drop generation failures. The detection circuits track temperature to determine if the drops are fired or not. In the figure heater 104 is generating a bubble within an actuator chamber. Underneath the heater is the temperature detection circuit 105 which records the temperature rise and decay. If no drop is generated then the ink remains in the chamber and the heater is completely uncovered by the bubble. If a drop is generated then some ink is left above the heater. These different conditions can be detected thermally. On the left the temperature detection circuits are shown. These are underneath the heater, separated by an insulating film. There are two circuits, 105a under the centre of the heater and 105b under the periphery of the heater. Both circuits have serpentine-shaped tracks to increase the circuit length and therefore the resistance, making it easier to measure variations in voltage in the circuit. The connections to the circuits 110 are taken out by vias to tracks on a layer underneath the detection circuits, so they are less affected by the temperature changes. The two circuits for each heater 105a and 105b are connected in a detection circuit. The outputs of differentiators 121 and 122 feed the comparator 123 resulting in Vout. If there is a drop discharge failure there is always a bubble on the surface of the actuator chamber above the heater, so the temperature gradually lowers. If a drop is generated then heat is removed from the chamber by the ink drop, so the temperature of the surface of the chamber decreases much more rapidly. 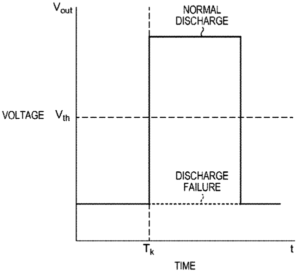 The graph shows the output voltage Vout from the comparator. If V2≥V1 then the output is high. If V1>V2 then the output is low. If no drop is generated then V1>V2 is always true so the output stays low. The time for the measurement Tk is chosen to be when the ink fragment left from the discharge should remain on the heater, and before the refill process. The detection circuits are integrated with the silicon substrate of the printhead die. The detection process is very sensitive yet accurate. no complicated signal processing is required, so detection is very fast. The benefits of circulating ink through the actuator chambers of ink jet printheads is now well known. The chambers are easily and quickly primed, air bubbles can be displaced, inks with a tendency for pigment settling or separation can be used, and fresh ink is brought to the nozzles reducing the requirements for nozzle maintenance. Ink passes from an inlet manifold 302 through passageway 225 into the actuator chamber 221. In this design a second passageway 223 close to the nozzle allows ink to return to a separate manifold 304. Ink being supplied to the printhead is fed under a positive pressure, and a negative pressure is applied to the return path. Overall though, the average pressure is slightly negative by arranging the negative pressure to be higher than the positive. Therefore there is enough differential pressure to achieve the continuous flow through the actuator chambers and a net negative pressure at the meniscus. The ink flow paths and pressure chambers within the printhead are made up from a stack of etched stainless steel plates that are bonded together. Note that as the inlet and outlet manifolds are both the same side of the actuator chambers, then the overall width of the printhead is minimised. 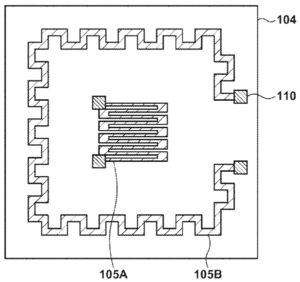 This patent application seeks to overcome two problems. When designing a high density printhead with multiple rows of nozzles it is difficult to provide electrical connections to actuators as the wiring must pass between other chambers. In addition the electrical contacts and piezo actuators may be sensitive to moisture. Connections between the external exible circuit board 25 with driver chips 24 and the actuators. The printhead assembly is connected to the wiring substrate layer 21 by a resin adhesive layer 30. This is patterned to provide cavities for the actuators and the ink channels. above the printhead is ink manifold 40. On the left the structure is shown in more detail. The wiring on the substrate 21 is more visible. Connections are made from the upper surface to the lower surface with vias. Both top and bottom surfaces of the wiring substrate are protected by films 26 and 28. As the wiring substrate only has ink passages through it, almost the whole surface is available for wiring tracks to the multiple actuator rows. On top of the piezo actuator is a gold bump 16. At the corresponding point on the wiring substrate is a solder bump 29. Heating the printhead to above the solder melting point of 139C makes the connection. the printhead and wiring substrates are fixed together by the resin adhesive layer 30 in the presence of dry nitrogen. This results in the actuators being encapsulated in a dry inert environment, preventing both the electrical connections and actuators from deterioration in the presence of moisture.